Did you know you can now order your Deliveroo takeaway from Tajima-Tei here on View? A large split level restaurant open for both lunch and dinner, Tajima-Tei offers a variety of Japanese dishes including sushi. Do you work at Tajima-Tei? What did you think of Tajima-Tei? I've never had anything bad at Tajima-Tei. The sushi is always fresh and tasty and the service and atmosphere feel genuinely Japanese. It's not too expensive to eat at Tajima-Tei either. Top marks all round! For many the experience of Japanese food in the capital is the ubiquitous chains such as Wasabi, Itsu and Japanese Canteen. For a more authentic taste of Japan, Tajima-Tei is the perfect choice. Although you are on Leather Lane, and just seconds from Holborn tube, you almost feel like you are in Tokyo or Kyoto, with an authentic feel engendered from the warm and respectful welcome as well as the option of low tables in the private rooms. 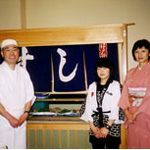 You will find expatriate Japanese businessmen dining with colleagues and clients as well as those just visiting the capital, and who have heard good things about this place. The atmosphere is one of calm dining, a long way from the frenetic fast food nature of the likes of Itsu. Tajimi-Tei specialises in sashimi and sushi but they do have wider choice with various bento boxes. At £18 their Tajima-Tei bento may not be cheap but with a selection of fresh sashimi, sushi, grilled yakitori stick, a deep fried dish and of course the staple cup of miso, it is more than enough to satisfy. The bento also serves as a good option for those relatively new to Japanese food, providing tastes of various dishes. The sashimi sets start at around £13.50 for an eight piece set, with assorted sushi sets starting at £13 and ranging up to £19 for a large 10 piece set, which is a good option for sharing. Overall, the food is of excellent quality, which is probably why it remains pretty busy throughout the week. Drinks at Tajima-Tei are very much as expected with a choice that's Japanese to the core. Beers such as Kirin, Asahi and Sapparo take pride of place alongside a selection of sake that is extensive by both the single serve and the bottle. Prices start at around £4, with a bottle at just over £40. The choice on offer includes Kasumitsuru which is especially imported by Tajima-Tei. Tajima-Tei is a more refined experience than most, with a price tag to match. It may not be cheap but the quality and service is second to none.